1Fixed to the Pound Sterling (GBP). The Falkland Islands (Spanish: Islas Malvinas) are an archipelago in the South Atlantic Ocean, located 300 miles from the coast of Argentina, 671 miles west of the Shag Rocks (South Georgia), and 584 miles north of Antarctica (Elephant Island). They consist of two main islands, East Falkland and West Falkland, together with 776 smaller islands. 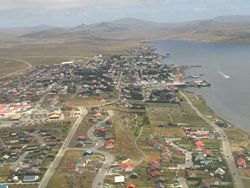 Stanley, on East Falkland, is the capital city. The islands are a self-governing Overseas Territory of the United Kingdom, but have been the subject of a claim to sovereignty by Argentina since the British invasion of 1833. In pursuit of this claim in 1982, the islands were invaded by Argentina, precipitating the two-month-long undeclared Falklands War between Argentina and the United Kingdom, which resulted in the defeat and withdrawal of Argentine forces. Since the war there has been strong economic growth in both fisheries and tourism. The inhabitants of the islands are British citizens since a 1983 Act and under Argentine Law are eligible for Argentine citizenship as well. Many islanders trace their origins on the islands to early nineteenth-century Scottish immigration, and reject the Argentine sovereignty claim. The name "Falklands" dates from an expedition led by John Strong in 1690, who named the islands after his patron, Anthony Cary, Fifth Viscount Falkland. The Spanish name for the islands, "Islas Malvinas," is derived from the French name "Îles Malouines," bestowed in 1764 by Louis Antoine de Bougainville, after the mariners and fishermen from the Breton port of Saint-Malo who became the island's first known human settlers. 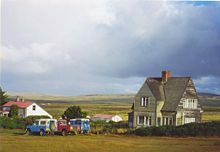 Due to the ongoing sovereignty dispute, Falkland Islanders often consider the use of Spanish names is considered offensive, particularly those associated with the Argentine invasion of 1982. General Sir Jeremy Moore would not allow the use of Islas Malvinas in the surrender document, for example, dismissing it as a propaganda term. The Falkland Islands have had a complex history since their discovery, with France, Britain, Spain, and Argentina all claiming possession, and establishing as well as abandoning settlements on the islands. 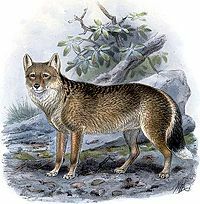 The existence of the Falkland Island fox, or Warrah (now extinct). It is thought that humans brought it to the islands, but it may have reached the islands via a land bridge when the sea level was much lower during the last ice age. A scattering of undated artifacts including arrowheads and the remains of a canoe. The first European explorer to sight the islands is widely thought to be Sebald de Weert, a Dutch sailor, in 1600. Although several British and Spanish historians maintain their own explorers discovered the islands earlier, some older maps, particularly Dutch ones, used the name "Sebald Islands," after de Weert. 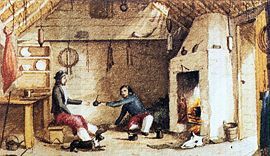 Falkland gauchos in the 1850s. In January 1690, English sailor John Strong, captain of the Welfare, was heading for Puerto Deseado (in Argentina); but driven off course by contrary winds, he reached the Sebald Islands instead and landed at Bold Cove. He sailed between the two principal islands and called the passage "Falkland Channel" (now Falkland Sound), after Anthony Cary, Fifth Viscount Falkland (1659–1694), who as Commissioner of the Admiralty had financed the expedition, later becoming First Lord of the Admiralty. From this body of water the island group later took its collective English name. The Falklands Crisis of 1770 was nearly the cause of a war between France, Spain and Britain. The Spanish government's claim was continued by Argentina after the latter's independence in 1816 and the independence war in 1817. The United Kingdom took control of the islands in 1833 following the destruction of the Argentine settlement at Puerto Luis by the American sloop USS Lexington (December 28 1831). The Royal Navy built a base at Stanley, and the islands became a strategic point for navigation around Cape Horn. A World War I naval battle, the Battle of Falkland Islands, took place in December 1914, with a British victory over the Germans. During World War II, Stanley served as a Royal Navy station and serviced ships which took part in the Battle of the River Plate. Sovereignty over the islands became an issue again in the latter half of the twentieth century. Argentina, which had never renounced its claim to the islands, saw the creation of the United Nations as an opportunity to present its case before the rest of the world. In 1945, upon signing the UN Charter, Argentina stated that it reserved its right to sovereignty of the islands, as well as its right to recover them. 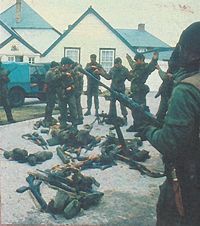 The United Kingdom responded in turn by stating that, as an essential precondition for the fulfillment of UN Resolution 1514, regarding the de-colonization of all territories still under foreign occupation, the Falklanders first had to vote for the British withdrawal at a referendum to be held on the issue. Talks between British and Argentine foreign missions took place in the 1960s, but failed to come to any meaningful conclusion. A major sticking point in all the negotiations was that the 2,000 inhabitants of mainly British descent preferred that the islands remain British territory. There were no air links to the islands until 1971, when the Argentine Air Force (FAA), which operates the state airline LADE, began amphibious flights between Comodoro Rivadavia and Stanley using Grumman HU-16 Albatross aircraft. Following a FAA request, the United Kingdom and Argentina reached an agreement for the FAA to construct the first runway. Flights began using Fokker F27 and continued with Fokker F28 aircraft twice a week until 1982. This was the only air link to the islands. Yacimientos Petrolíferos Fiscales (YPF), the Argentine national oil and gas company, now part of Repsol YPF, supplied the islands' energy needs. British soldiers surrender to Argentine forces during the 1982 invasion of the Falklands by Argentina. On April 2, 1982, Argentina invaded and temporarily occupied the Falkland Islands and other British territories in the South Atlantic (South Georgia and the South Sandwich Islands), a move which successfully diverted public attention from the nation's poor economic performance. The United Kingdom's reduction in military capacity in the South Atlantic may have encouraged the invasion. The Foreign Secretary, Lord Carrington, and two junior ministers had resigned by the end of the week following the Argentinian invasion, taking the blame for Britain's poor preparations and plans to decommission HMS Endurance, the Navy's only Antarctic patrol vessel. The United Nations Security Council issued Resolution 502, calling on Argentina to withdraw forces from the Islands and to both parties to seek a diplomatic solution. International reaction ranged from support in the Latin American countries (with the exception of Chile), to opposition in Europe (with the exception of Spain), the Commonwealth, and eventually the United States. The British sent an expeditionary force to retake the islands, leading to the Falklands War. After short but fierce naval and air battles, the British landed at San Carlos Water on May 21, and a land campaign followed until the Argentine forces surrendered on June 14. Following the war, the British increased their military presence on the islands, constructing RAF Mount Pleasant and increasing the military garrison. Although the United Kingdom and Argentina resumed diplomatic relations in 1989, no further negotiations on sovereignty have taken place. Falkland Islanders were granted full British citizenship from January 1, 1983 under the British Nationality (Falkland Islands) Act 1983. Executive authority of the Falkland Islands is vested in the British Monarch and is exercised by the Governor on her behalf. The Governor is also responsible for the administration of South Georgia and the South Sandwich Islands, as these islands have no native inhabitants. Defense and Foreign Affairs are the responsibility of the United Kingdom. Under the constitution, the latest version of which came into force in 1985, there is an Executive Council and a Legislative Council. The Executive Council, which advises the governor, is also chaired by the governor. It consists of the chief executive, financial secretary, and three legislative councilors, who are elected by the other legislative councilors. The Legislative Council consists of the chief executive, financial secretary, and the eight legislative councilors, of whom five are elected from Stanley and three from Camp, for four-year terms. It is presided over by a speaker. Although the loss of the war against the United Kingdom over control of the islands led to the collapse of the Argentine military dictatorship in 1983, disputes over control of the islands continue. In 1992, Argentina and Britain resumed diplomatic relations and reopened their embassies in each other's countries. In 1998, in retaliation to former Chilean president Augusto Pinochet's arrest in London, the Chilean government banned flights between Punta Arenas and Port Stanley, thus isolating the islands from the rest of the world. Uruguay and Brazil refused to authorize direct flights between their territories and Port Stanley, forcing the Islands' government to enter negotiations with the Argentine government which led to Argentina authorizing direct flights between its territory and Stanley, on condition that Argentine citizens be allowed on the islands. British Prime Minister Tony Blair became the first Prime Minister to visit Argentina since the war. On the twenty-second anniversary of the war, Argentina's President Néstor Kirchner gave a speech insisting that the islands should once again be part of Argentina. Kirchner, campaigning for president in 2003, regarded the islands as a top priority. In June 2003, the issue was brought before a United Nations committee, and attempts have been made to open talks with the United Kingdom to resolve the issue of the islands. The Falkland Islanders themselves, however, are almost entirely British and maintain their allegiance to the United Kingdom. On April 2, 2007, exactly 25 years after the Argentine invasion, Argentina renewed its claim over the Falkland Islands, asking for the United Kingdom to resume talks on sovereignty. The Falkland Islands comprise two main islands, East Falkland and West Falkland (in spanish Isla Gran Malvina and Isla Soledad respectevely) and about 700 small islands. The total land area is 4,700 square miles, approximately the same area as Connecticut or Northern Ireland, and a coastline estimated at 800 miles. Much of the land is part of the two main islands separated by the Falkland Sound: East Falkland, home to the capital of Stanley and the majority of the population, and West Falkland. Both islands have mountain ranges, rising to 2,313 feet at Mount Usborne on East Falkland. There are also some boggy plains, most notably Lafonia, the southern half of East Falkland. Virtually the entire area of the islands is used as pasture for sheep. Smaller islands surround the main two. They include Barren Island, Beaver Island, Bleaker Island, Carcass Island, George Island, Keppel Island, Lively Island, New Island, Pebble Island, Saunders Island, Sealion Island, Speedwell Island, Staats Island, Weddell Island, and West Point Island. The Jason Islands lie to the northwest of the main archipelago, and Beauchene Island some distance to its south. Speedwell Island and George Island are split from East Falkland by Engle Passage. The islands claim a territorial sea of 12 nautical miles and an exclusive fishing zone of 200 nautical miles, which has been a source of disagreement with Argentina. The Falkland Islands have a cold marine climate with strong westerly winds. It is generally cloudy and humid; rain occurs on more than half the days in a typical year. Snow is rare, but can occur at almost any time of year. Islanders themselves talk about two main areas of the islands, namely Stanley and the rest, which they call "the Camp," from the Spanish campo ("countryside"). 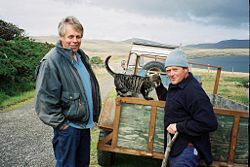 Sheep farming was formerly the main source of income for the islands, and still plays an important part with high quality wool exports going to the United Kingdom, but efforts to diversify introduced in 1984 have made fishing the largest part of the economy and brought increasing income from tourism. The government sale of fishing licenses to foreign countries has brought in more than $82.3 million a year in revenues, and local fishing boats are also in operation. More than 75 percent of the fish taken are squid, and most exports are to Spain. Tourism has shown rapid growth, with more than 30,000 visitors in 2001. The islands have become a regular port of call for the growing market of cruise ships. Attractions include the scenery and wildlife conservation with penguins, seabirds, seals, and sealions, and visits to battlefields, golf, fishing, and wreck diving. An agreement with Argentina has set the terms for exploitation of offshore resources including large oil reserves, but climatic conditions of the southern seas mean that exploitation will be a difficult task, though economically viable, and the continuing sovereignty dispute with Argentina is hampering progress. Defense is provided by the United Kingdom and British military expenditure makes a significant contribution to the economy. The islands are self-sufficient except for defense, exports account for more than $257.1 million a year. The largest company in the islands used to be the Falkland Islands Company (FIC), a publicly quoted company on the London Stock Exchange and was responsible for the majority of the economic activity on the islands, though its farms were sold in 1991 to the Falkland Islands Government. The FIC now operates several retail outlets in Stanley and is involved in port services and shipping operation. The currency in use is the Falkland Pound, which remains in parity with Pounds Sterling—sterling, both notes and coins, circulate interchangeably with the local currency. The Falkland Islands also mint their own coins, and issue stamps which forms a source of revenue from overseas collectors. The population is 2,967 (July 2003 estimate), the majority of which are of British descent (approximately 70 percent). The native-born inhabitants call themselves "Islanders." Outsiders often call Islanders "Kelpers," from the kelp which grows profusely around the islands, but the name is no longer used in the Islands. Those people from the United Kingdom who have obtained Falkland Island status, became what are known locally as "belongers," or to mean the islands belonged to Great Britain. The great majority of islanders are of Scottish and Ulster Scots descent. However, a few Islanders are of French, Portuguese, and Scandinavian descent. Some are the descendants of whalers who reached the Islands during the last two centuries. Furthermore, there is a small minority of South American, mainly Chilean origin, and in more recent times many people from Saint Helena have also come to work in the Islands. The Falkland Islands have been a center of English language-learning for South Americans. The main religion is Christianity. The main denominations are Church of England, Roman Catholicism, United Free Church, Evangelist Church, Jehovah's Witnesses, Lutheranism, and Seventh-day Adventism. 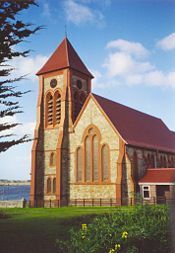 The extra-provincial Anglican parish of the Falkland Islands is under the direct jurisdiction of the Archbishop of Canterbury. The Falklands Islands form an Apostolic Prefecture of the Catholic Church. There is a small Greek Orthodox church in the Islands due to the presence of Greek fishermen. The Falkland Islands Government Health and Social Services Department provides medical care for the islands. The King Edward VII Memorial Hospital (KEMH) is Stanley's only hospital. It was partially military operated in the past, but is now under complete civilian control. There are no ophthalmologists or opticians on the islands, although an optician from the United Kingdom visits about every six months and an ophthalmologist comes to do cataract surgery and eye exams on irregular intervals (once every few years). There are two dentists on the islands. PAL television, using the UK VHF and UHF allocations is standard. FM stereo broadcasting using the UK allocation is standard. MW broadcasting using 10 kHz steps (standard in ITU Zone I). Fiber-optic communications: not yet present. Telephoning, mostly by microwave relay. Telephoning, via shortwave (SSB mode) is used for outlying settlements. The Dash-7 of the British Antarctic Survey at Stanley. The Falkland Islands has two airports with paved runways. RAF Mount Pleasant, 30 miles west of Stanley, acts as the main international airport, with flights operated by the Royal Air Force to RAF Brize Norton in Oxfordshire, England via a refueling stop at RAF Ascension Island. RAF flights are on Tri-Stars although it is common for charter aircraft to be used if the Tri-Stars are required for operational flights. At present, (December 2006) the RAF air link is operated by Air Atlanta Icelandic, using 747s. Flights are also available to Chile operated by LAN. Port Stanley Airport is a smaller airport outside the city, and is used for internal flights. Most settlements have grass air strips which are served by Islander aircraft of the Falkland Islands Government Air Service (FIGAS). The internal-flight schedule is decided a day in advance according to passenger needs, and an announcement made on the radio detailing arrival and departure times the night before. The British International (BRINTEL) company also operate two Sikorsky S61N helicopters for passenger flights between the islands. The British Antarctic Survey operates a transcontinental air link between the Falkland Islands and the Rothera base airfield, servicing also other British bases in the British Antarctic Territory using a de Havilland Canada Dash 7. The road network has been improved in recent years. However, not too many paved roads exist outside Stanley and the RAF base. Approximately 25,000 land mines remain from the 1982 war which are securely and clearly fenced off. Free maps are available from the EOD (Explosive Ordnance Disposal) office in Stanley. Care should still be taken as some beaches were mined and there have been concerns the tides could have moved some mines. The same applies where mine fields are close to rivers. Care should be taken in case mines have been washed out of the marked area by flooding. There is also ordnance left over from the war, although finds of this type are becoming rarer with the passage of time. 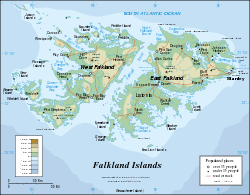 ↑ Falkland Islands Government Overview. falklands.gov. Retrieved November 24, 2007. This page was last modified on 25 March 2017, at 15:53.